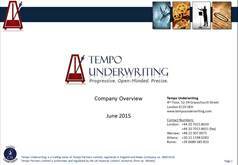 Tom is a founder of Tempo Underwriting and is responsible for carrier relationships and business operations. Tom’s career in the insurance industry has encompassed broking, technology and operations. For the last 11 years, Tom has been Managing Director of Catex Europe and heavily involved in the management and establishment of a number of MGAs, brokers and carriers. Tom’s early career was spent in insurance and reinsurance broking with Sedgwick, Sedgwick Re and Guy Carpenter. Tom is ACII qualified and is a Chartered Insurer. He is Vice-Commodore of Lloyd’s Yacht Club, a qualified Yachtmaster and speaks English and French.